things that shine: it was a party! a confetti party! it was a party! a confetti party! Or, a party inspired by confetti. Lady Bon-Bon turned one and we had a small birthday party at home for her. My parents and my sister and her family attended. I decided to make a few party decorations and a cake (and smash cake for her!) in pale pinks, champagne, cream, silver and gold. 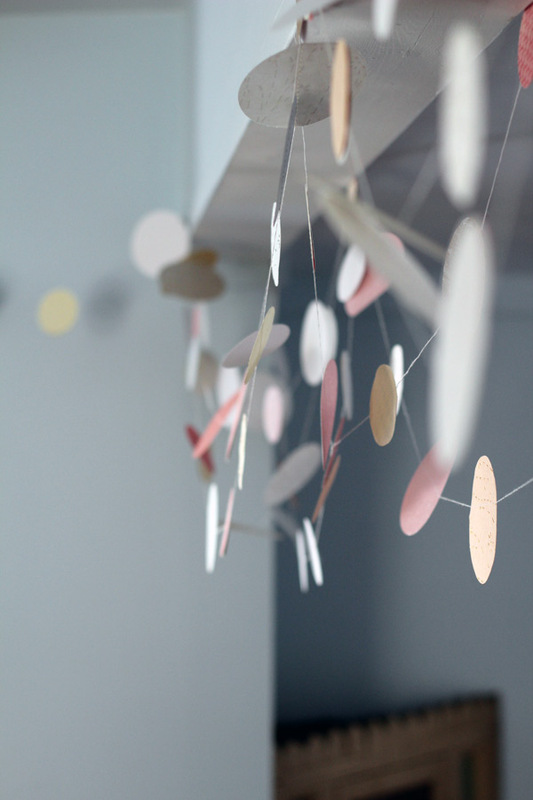 I wanted everything to feel light and airy, but not frilly or foofy. I wanted the party to feel like confetti. I only decided to do all of this the day before, so the decorations had to be fast, and easy! Happy, happy, happy! Party girl. The colour didn't translate well in my photos, but I tinted the icing just the palest shade of pink. Because I use half butter and half shortening in my icing, the tiny bit of yellow made the cake a lovely champagne type colour. I had originally planned on making the cake much pinker, but loved this colour so much I decided to go with it. 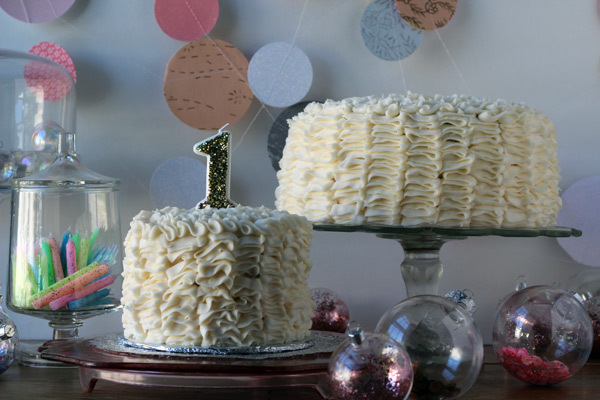 This ruffle cake is SO pretty and so easy to make. After assembling all the layers and adding a crumbcoat, I just piped on the ruffles in rows going from the bottom of the cake to the top. Use a Wilton no. 103 tip -- it looks sort of like a flattened tear drop shape. Hold the piping bag vertically, so it is parallel to the side of the cake. Turn the bag so the *widest* part of the tip is up against the side of the cake. Being piping and swirl the bag back and forth in a zig-zag or S shape. I wanted my ruffles to be free form and not as structured as some of the ruffle cakes you see, so I moved more slowly and let the icing "fall" into place. I finished the tops of the cakes by piping a ruffle around the edge and then filling the centre with a random ruffle pattern, working in from the edges towards the centre of the cake. 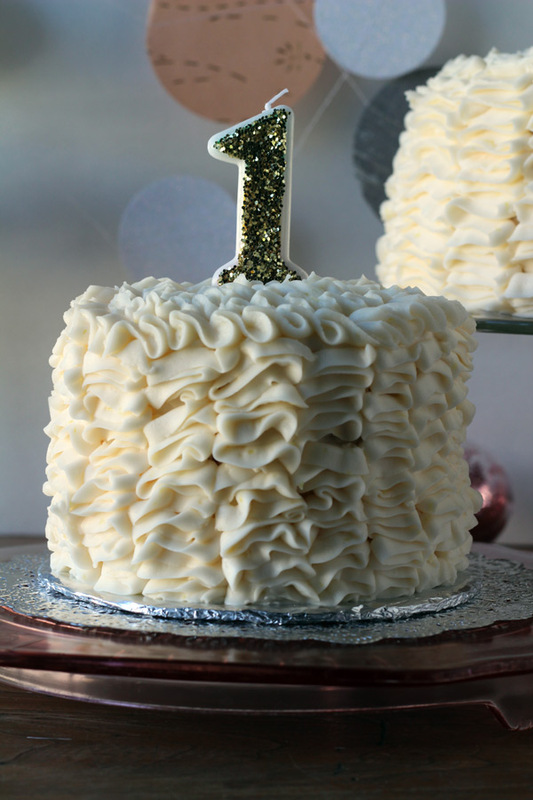 Next time I make one of these, I think I am going to find something to fill the top of the cake with -- create a big ruffle around the edge and then fill the centre with chocolate shavings or edible confetti, or something totally delicious and totally pretty. A big sparkly gold one for my sparkly big girl! 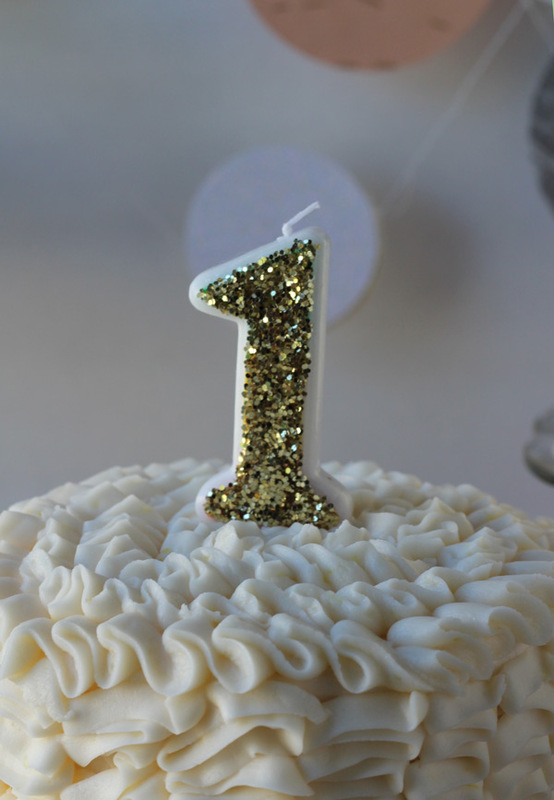 I used a cheap number 1 candle from the dollar store -- the kind with the rainbow outline in the shape of a number one painted on the candle. I used Glossy Accents and covered the rainbow outline with adhesive, then flooded the centre and covered with chunky gold glitter. I let it dry thoroughly and carefully tapped off the excess. Once it was completely dry I turned it over and glittered the backside, too. 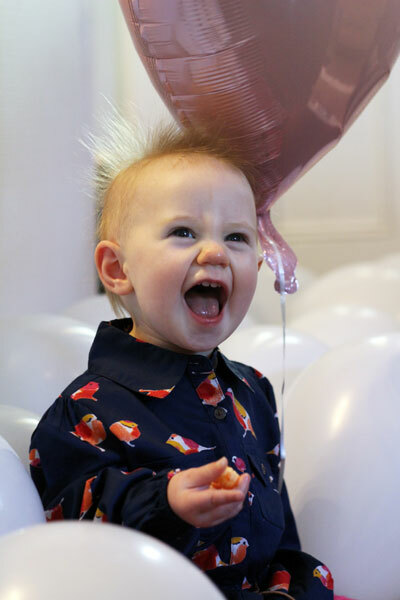 When shopping for party-making supplies, I let myself feel inspired by the idea of a party filled with bubbles and balloons and light and airy feelings and everything that makes a party feel like a party. I found clear glass ornaments in the Christmas section at Hobby Lobby, and bought several packages in three different sizes. These are the large and medium sizes. Then I headed to the glitter aisle and bought sequins and glitter in pinks, whites and golds. 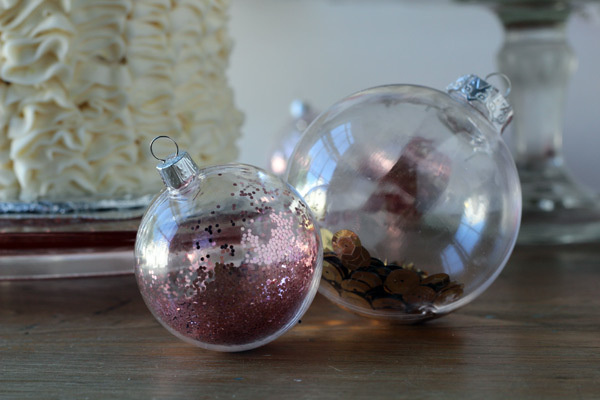 I filled up the ball ornaments with a single colour and type of filler and put them out on the tables, hung from the ceiling in clusters, and filled cupcake stands and apothecary jars with them. 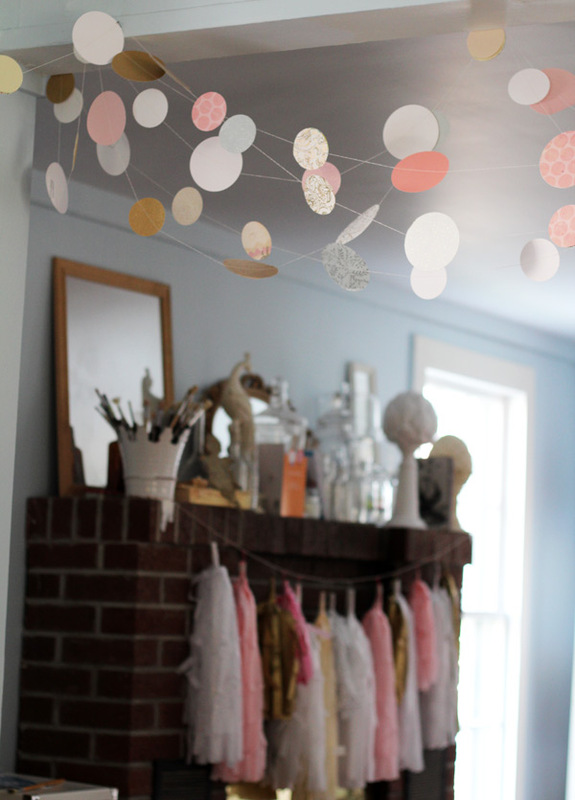 A confetti garland! I sorted through my patterned paper stash and pulled out everything I could find in creams, white, silver, gold, pinks and champagnes. I often keep old papers that I don't think I'll use for scrapbook layouts, but still like the colour or finish or pattern on, to use for projects like this. I punched out circles in two sizes -- I think these are 3 inches and 2.5 inches. Then I shuffled them and sewed them together in random order. A lot of the papers were double sided, so if the backside was pretty, I just used a single circle. If the backside was unfinished I placed two circles of the same size back-to-back and sewed together through both layers. I didn't worry about lining up fronts vs backs when I was sewing, because the entire garland moved and swayed and the circles easily flipped over. I hung the garland all over the rooms and across windows. I love the way it felt like confetti floating in the air! 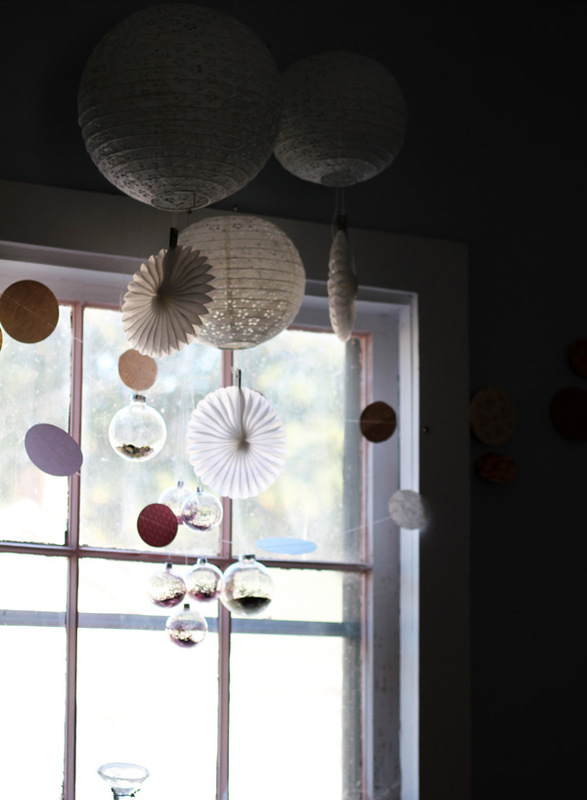 I also hung clusteres of eyelet lace lanterns, paper fans and the filled ball ornaments in front of the windows and in other places in the house. 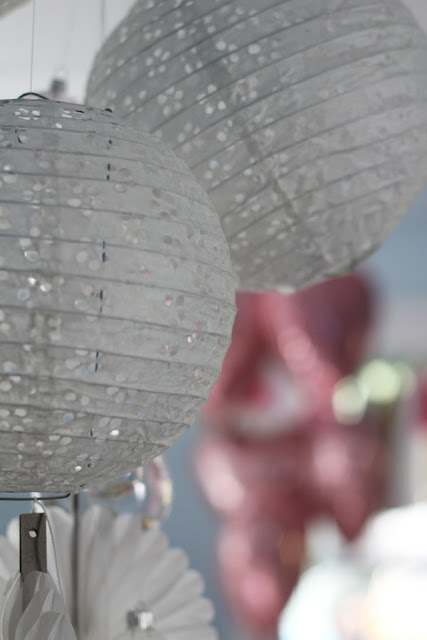 These lanterns are eyelet lace paper and are made by Martha Stewart. They come in sets of three -- two small and one large. The folded paper fans are from Hobby Lobby. I've made the large folded paper rosettes that are so popular right now for other parties, but because I threw this together the day before, I didn't have time. 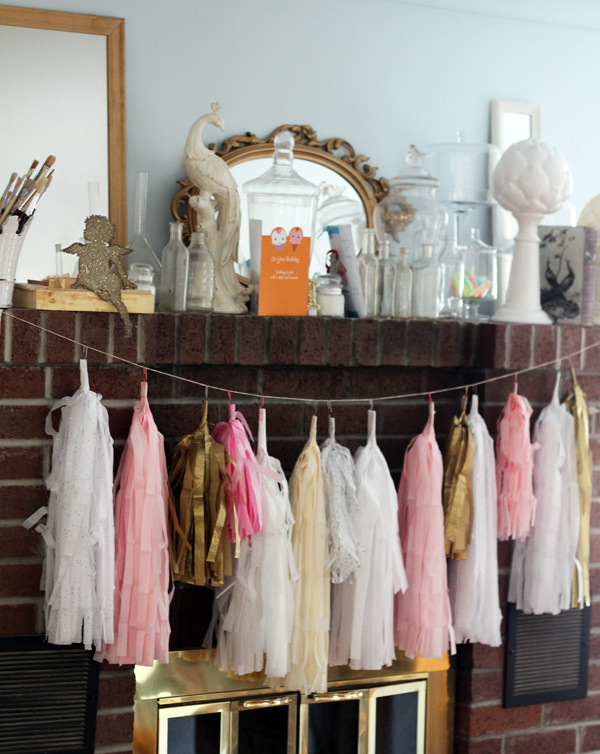 These little tissue paper fans were an easy and pretty alternative! 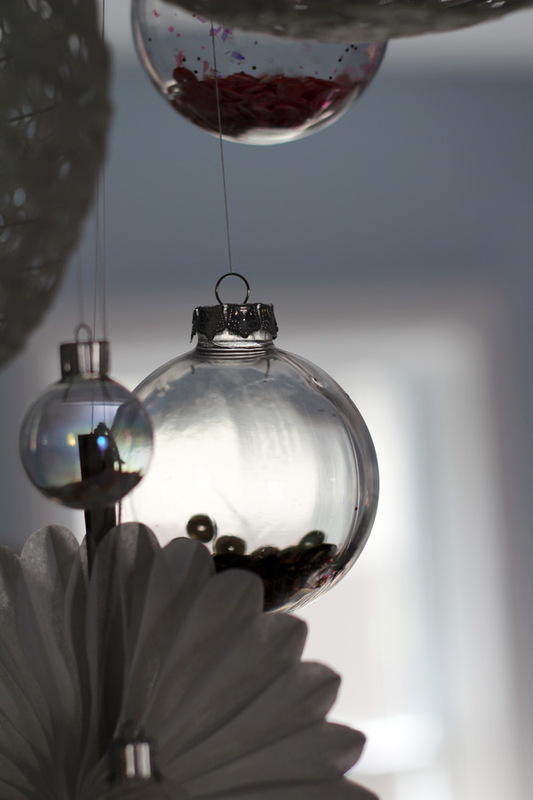 I loved the way the ball ornaments caught the light and looked different from different angles. 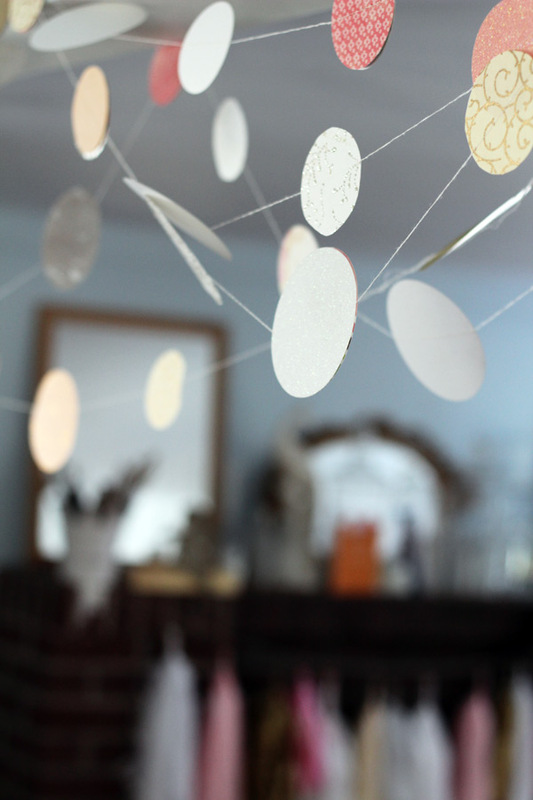 They definitely added a nice airy feeling, like pretty bubbles to the party. 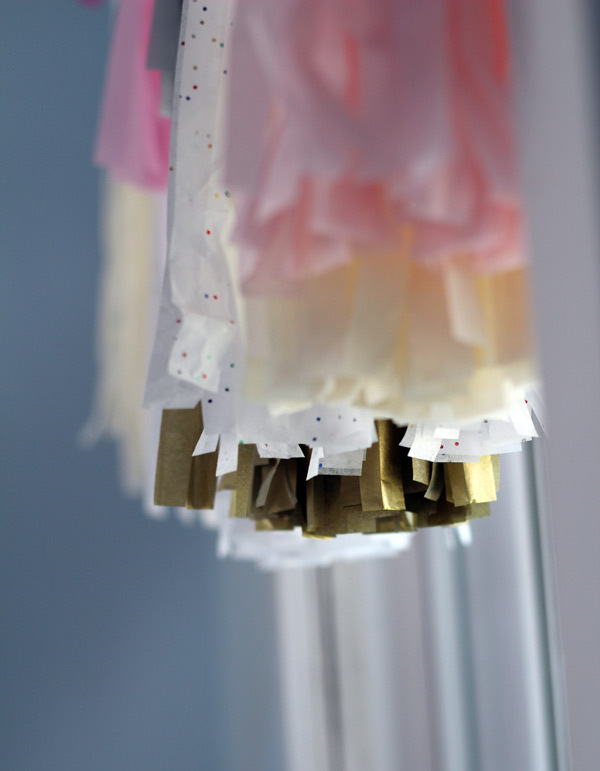 I made dozens of large tassels from tissue paper. I confess that I have a hard time throwing away nice tissue paper. Whenever I receive an especially cool colour or pattern as gift wrapping, I carefully flatten it back out and fold it up to be used in a decor or craft project. Almost half of the tissue paper in the tassels was re-used, and then I found some more off-white, gold, and pale pink at Hobby Lobby for 0.99 a package. For each tassel I used three sheets of tissue paper. Each tassel is the length of a piece of tissue paper. I stacked four sheets of tissue paper up and folded them in half, and then half again. I cut slits in the stack of tissue paper from the bottom to about 1.5 inches from the top of the sheet. This made a sort of tissue paper fringe, with everything still uncut and attached together at the top. Then I folded/rolled up the stack and secured the top, uncut section with staples. I pulled apart the tissue paper fringes and fluffed up with my hands. These looked so amazing, and I left them up for a week after the party. I hated to take them down! I might make another set for the holidays to hang up on the fireplace. It feels so bare over there, now! Tissue tassels hung in front of the window! So pretty! Thanks for posting the pics! You did a wonderful job with the decorations.